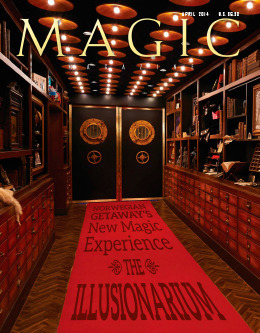 Today, when you order "MAGIC Magazine: April 2014 ISSUE", you'll instantly be emailed a Penguin Magic gift certificate. You can spend it on anything you like at Penguin, just like cash. Just complete your order as normal, and within seconds you'll get an email with your gift certificate. Norwegian Cruise Lines' newest ship, the Getaway, features magic's newest showplace: The Illusionarium. Working with Jeff Hobson, NCL created an otherworldly multimillion-dollar venue where "the world's greatest magicians" do battle twice nightly. Magician, collector, historian, author, publisher, photographer, and opinionated artist — Wittus Witt holds a unique place in the world of magic, not only in his native Germany, but around the world. The Magic Castle recently hosted a panel discussion on various aspects of creating and performing magic in character. Rob Zabrecky moderated the evening, interviewing Ed Alonzo, Tina Lenert, John Lovick, and Woody Pittman — all of whom did not necessarily have similar opinions on the subjects. At Northwestern University in Chicago, Dr. Ricardo Rosenkranz teaches medical students to be better doctors — by teaching them magic. His popular Magic & Medicine classes open students' eyes to the importance of relating to their patients as magicians do to their audiences. Karl Hein is well known for his amazing card handling abilities and his naturally disarming performance style. At 36, he has made his living for the past fifteen years performing close-up magic and stand-up shows for private and corporate events. 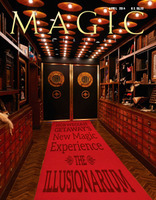 In the magic world, he has presented over 100 lectures in 15 countries and released a number of tutorial DVDs; The Heinous Collection is his latest DVD set. MAGIC Magazine readers can take a "First Look" at Collecting Camaro — a Triumph routine that packs a really big punch — and learn Karl's famous yet practical Heinous Shuffle, as well as some of Karl's thoughts on choosing the right shuffle for the right situation. A simple close-up item you can perform at the drop of a hat is this month's "Loving Mentalism" offering. It's a good one to know if you're feeling lazy, since it's entirely "hands off all the way. You don't do anything, touch anything, or decide anything. It's all about a little game in which your spectator friend can win a thousand dollars. The spectator does all the work, makes all the decisions, and is in control from start to finish, yet somehow fails to win your money. It's simple, but there are a few little subtleties you might like. Which came first, the gimmick or the trick? I always feel a little guilty when a prop inspires a trick or a joke. My gut tells me it's always better the other way around: you think of an idea and then find or build the prop to make that idea a reality. But sometimes you just find or think of something so unusual that you end up with a great prop in search of a great routine. And that's exactly what I'm offering this month — a utility prop that must have a million uses. I have some ideas on what they might be, but I'm going to leave the rest up to you. Late one night, George Kirkendall scared the daylights out of some wide-eyed magicians with his masterful performance of Karl Germain's Spirit Lock. The tale was told of the magician Faust who had been imprisoned in a dungeon "by this very lock," and the sudden opening of the lock was startling. Charles Bertram had this lock made in England during the 1890s. During the next century, ownership of the lock passed from Bertram, to Edward Maro, to Karl Germain, to Stuart Cramer, to George Kirkendall, and finally to Tim Moore. The author of this letter was the fourth owner, Stuart Cramer. As luck would have it, Stuart grew up in Cleveland and became lifelong friends with that city's most famous magician, Karl Germain. During the decades of their friendship, Stuart acquired a great deal of Germain's magic and ephemera. Big is the next big thing. Big magic and variety shows are touring the world just like the good old days — whenever that was. This is the year of the Big Multi-Act Magic Show. These shows have been performed for hundreds of thousands of people and collectively employ more than 35 top-tier magicians. That's enough to positively impact the fragile balance of supply and demand in our magic micro-economy. Stringing magic acts together can be an effective presentation. But it is not long before the temptation to â€œadd" comes into play. The question is: is the whole greater than the sum of the parts? Close-up magic projected onto big screens is becoming more and more common. We're seeing it everywhere, from magic conventions and competitions, to charity galas, solo shows, and everything in between. When done effectively, using a camera and projector to magnify a small trick for a big audience can be incredibly powerful. However, when used badly, it can really mess up a show. Over the past several years, I've had a huge amount of time performing projector-magnified tricks for large audiences, and I've noticed that there are a few simple things that can make all the difference between brilliant and terrible projector work. Why Don't Magic Get No Respect? The question before us, ladies and gentlemen, is this: "Why don't magic get no respect?" Or more literately stated, "Why isn't magic respected as an equal among the theater arts?" We understand that there are many answers to this question but we offer only two, a Long one and a Short one. You'll get both. Further, we assume that you agree with our proposition that, among the theater arts, magic does not receive the respect that it deserves and that it would be useful to know why. So we begin with this quote from Sir Winston Churchill who said, "All generalizations aren't worth a damn — including this one." You have been warned. The world of school shows is very different from the simple times of our youth. This past month, while performing at an elementary school, an announcement over the public address system stated that the school was going into a lockdown status. We were told to lock the classroom door and lower a screen to cover the glass window in the door. In addition, the blinds were lowered and the lights of the classroom were turned off. We were told to find cover away from the windows and door. The foremost thought in my mind was, â€œThank God this is just a drill." In addition, I realized that the whole issue of security in elementary schools had changed dramatically. As a school show presenter, I needed to re-examine the subject.